But this Sorry, we couldn’t get the list of sites message is a red herring. It simply means that you don’t have any sites connected to Groups. e.g. Microsoft teams sites. This will however take forever! I also tried the copying of documents in a few of my test environments and it is working in all of them. So it might be something related to these specific libraries in this Office 365 environment. I tried the classic experienced instead and that one did work successfully. But the interface for copying documents is a lot less friendly. However while the modern one isn’t working for you it might be the only option. I even tried copying the files using Microsoft Flow and there is no issue. 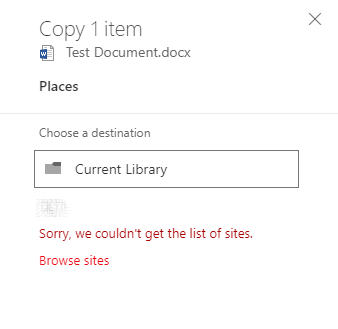 Just the modern list experience can’t copy or move documents to these large libraries. Then I tried to copy a document to a different library and all seem to work. After while the reason for the hanging copies became clearer. When the destination library exceeds the 5000 documents you will see this error. 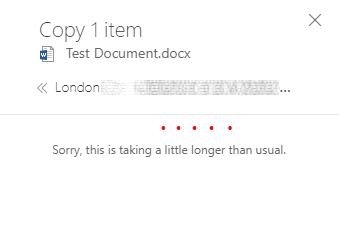 I understand that displaying many document can be a problem. But when you have a large number of documents in a library it is impossible to add any more document if you use the modern interface, but when you use Flow or the traditional interface things don’t work that is just not right! I asked Marc ‘5000 items in a list expert’ Anderson and he also agreed that this is simply a bug! Now we just need to get Microsoft to agree. I wanted to give a quick follow-up. We have determined the root cause of the bug and know roughly what we need to do to fix it. We can’t give any type of ETA here; only confirm that we do believe this is a bug we need to fix and will consider it against our overall backlog for June (or in future months if we can’t fit it then). Thanks again for reporting the issue! So hopefully we can see a fix for this soon. A few months ago we encountered this issue same issue at a customer site…while being investigated by MS at some point it went away. Very strange. 100% sure it had nothing to do with libraries exceeding 5.000 documents. Hmmm. Thnx for the update! The odd thing is that is is failing in the modern experience only when we copy it to 2 libraries (out of about 20) and both of these 2 libraries have over 7000 documents.